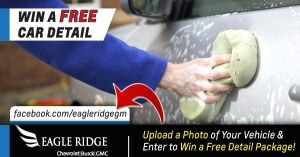 Eagle Ridge GM | Blog | Win a Free Car Detail! Win a Free Car Detail! Eagle Ridge GM would like to help Clean Up Your Ride in time for Spring. Head over to the Eagle Ridge GM Facebook Page to upload a picture of your dirty vehicle prior to April 11, 2014. One winner will be selected at random to receive a vehicle detail. Winner will be announced on the Eagle Ridge GM Facebook page! The winner will be selected at random from all eligible entries to receive a vehicle detail. This includes an interior vacuum, window and dash clean and exterior wash. The prize has no cash value and can not be exchanged for any other product or service. Eagle Ridge GM will contact the winner to schedule a time that for the vehicle to be cleaned. The detail will be completed at Eagle Ridge GM and must take place on the vehicle uploaded in the winning picture. All entries will be put into an album on the Eagle Ridge GM Facebook page (http://facebook.com/EagleRidgeGM).